One big difference between Emma Gonzales and Marianne is that Marianne was never an actual flesh and blood young woman turned symbol. She was born as a symbol, named in the struggle leading up to, during, and after the French Revolution with the two most common French female names: Marie and Anne. She's the Jane Doe of revolutionary thinking. Created in 1775 by painter Jean-Michel Moreau, she rose to prominence in July 1789 (a date that will be familiar to French history buffs) by appearing on one side of a revolutionary medal which commemorated the storming of the Bastille. In 1792, she was officially selected to be the embodiment of liberty and the new political order for the first French Republic. The fact that a woman was used as a symbol to lead the country was seen, in and of itself, as revolutionary, in a country that had a purely patriarchal, patrilineal tradition with a history of rule by Kings only. 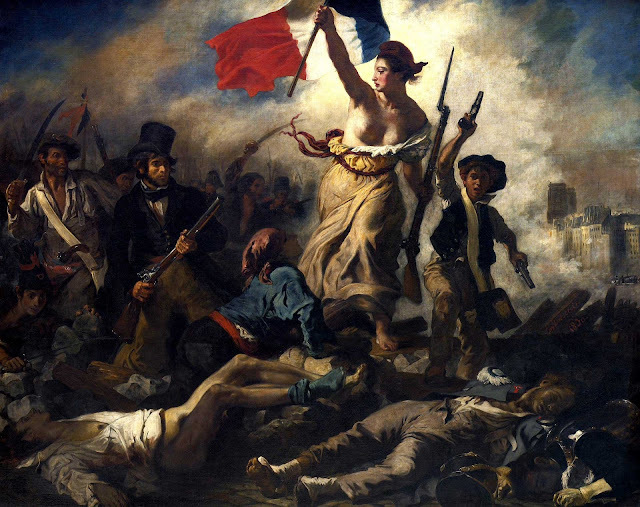 It also works well that she represents la France, la Republique, la Liberté, l'Equalité, and la Fraternité (brotherhood) -- all of which are female gendered nouns (yes, even brotherhood). Though times have changed, Marianne has not. She is virtually always represented in the style of a Greek Goddess. When her full body is shown, she's usually standing or striding, holding the pike of the revolution topped by the Phrygian cap (hailing from Eastern Europe and also called a liberty cap). 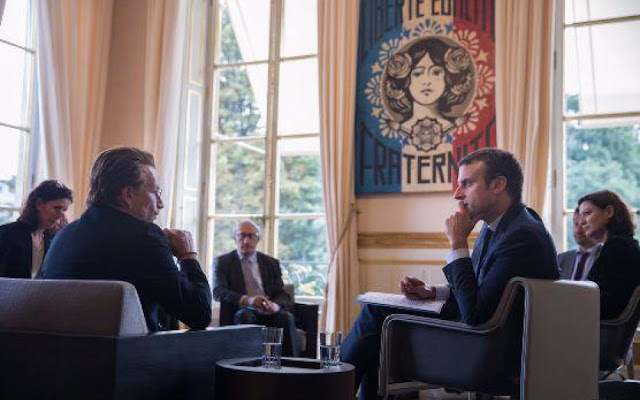 When my dear American-in-Paris friend was going through the process to become a French citizen, one of the questions the officials asked her was "Where can you find Marianne?" She was flummoxed at first, not because she didn't know who Marianne was or where to find her, but more because the more manageable question would have been "Where can you not find Marianne?" When I say Marianne is ubiquitous, I mean from the smallest to the biggest images. She is on the back of some French-issued Euro coins; in uncountable paintings and pieces of art, including an 1879 sculpture called Triumph of the Republic overlooking the Place de la Nation on the border of the 11th and 12th arrondissements of Paris; in official buildings; on official seals; in courthouses; on postage stamps, etc. 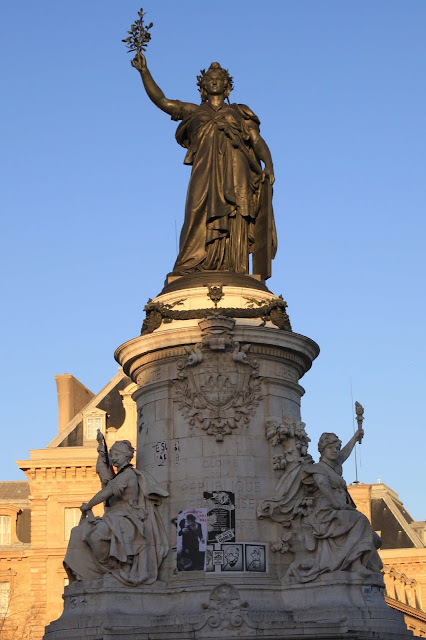 Or you can find her just a couple of places over at Place de la République, at the border of the 3rd, 10th, and 11th arrondissements, in the statue called the Monument to the Republic. She even has her own magazine. You will not be surprised to see which issue of Marianne I keep, permanently, on my desk. Even if you're not French, you've seen Marianne in such places as the famous Eugène Delacroix painting "Liberty Leading the People" ("La liberte guidant le peuple"), commemorating the July 1830 revolution (because students of French history will also remember that the first revolution didn't quite stick). This painting, in turn, clearly served as the inspiration for the choreography and all those posters for the musical Les Misérables. From the farthest corners of France to the lights of Broadway, Marianne really is everywhere. And the lesson from this is clear: Never underestimate the influence of the powerful symbol of a woman inspiring change. 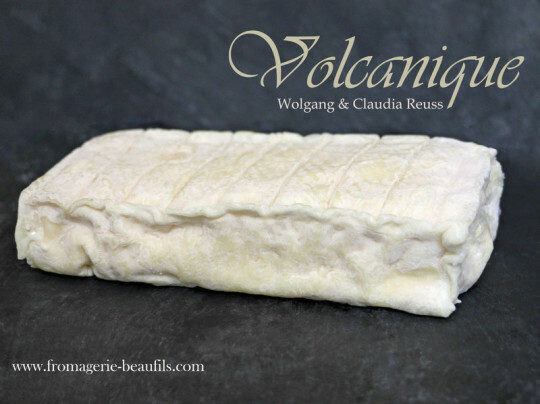 Volcanique is a raw goats' milk cheese from the Auvergne, made at the Ferme Reuss by Wolfgang and Claudia Reuss, whose cheese have won 28 medals from different regional and national cheese contests. 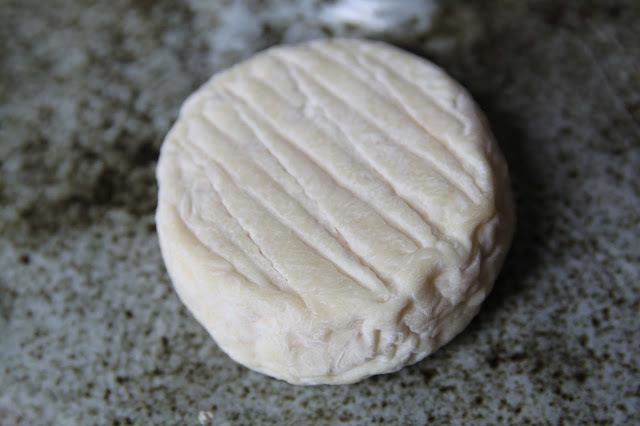 Aged two-three weeks, it's a young cheese, but considered "semi-aged." This means it has a distinct flavor and some potency, despite its youth. It's a creamy, luscious cheese that explodes and oozes in a very volcanic way, indeed, with strong floral and grassy undertones. There is a larger-scale version, called Grand Volcanique. 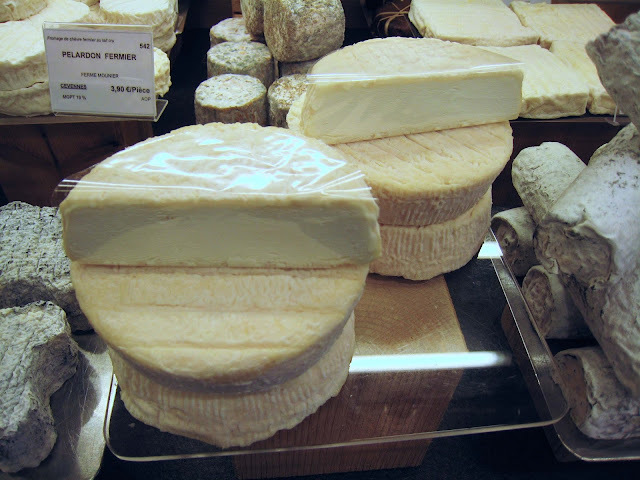 Not only does it come in two different sizes as two slightly different cheeses (because in cheese, with the aging process and the resulting flavor and texture, size really does matter), it also, oddly, comes in two different shapes. 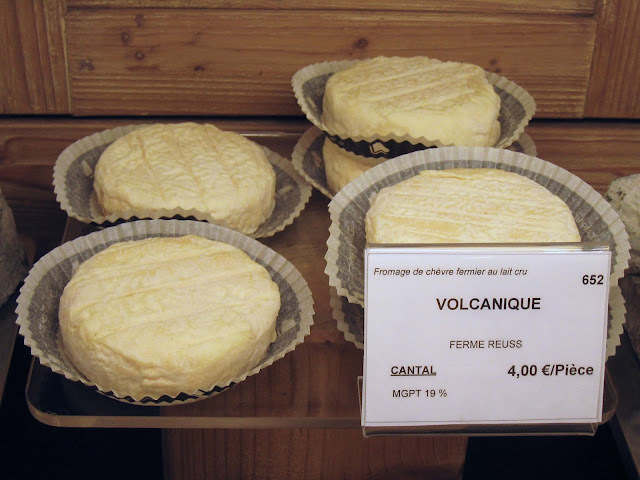 Both the round form and the brick form are made by the same Ferme Reuss and labeled as Volcanique cheese. Wolfgang and Claudia Reuss, the makers of Volcanique, hail from Germany, became French citizens, and may have needed to answer this same question about Marianne during their citizenship interview. If they didn't know about her then, after nearly 30 years living in the country, they certainly know about her now. I also like that this cheese comes in two shapes, both made at the same farm and given the same name. Emma and Marianne don't share the same name, but they do seem to be made of the same stuff. The cheese, like the women discussed, is young but strong (by name, even explosive).